It's no secret: I'm a little bit obsessed with memoirs. For the past decade, they've been my go-to genre, and I truly can't get enough. I've always had a fascination with the lives of others, especially those that are so different than mine—or, at times, that are so similar to mine and make me feel less alone. Stories of survival, stories of adventure, stories that make me laugh while reading the pages (or, at times, cry so hard I risk ruining a library book). I think that my love of this genre has to do with getting to read the story of another person, most often in their own words, and for a short time being completely wrapped up in their world. Hopefully these lists will help those of you who typically stick to fiction and are eager to try out something new! 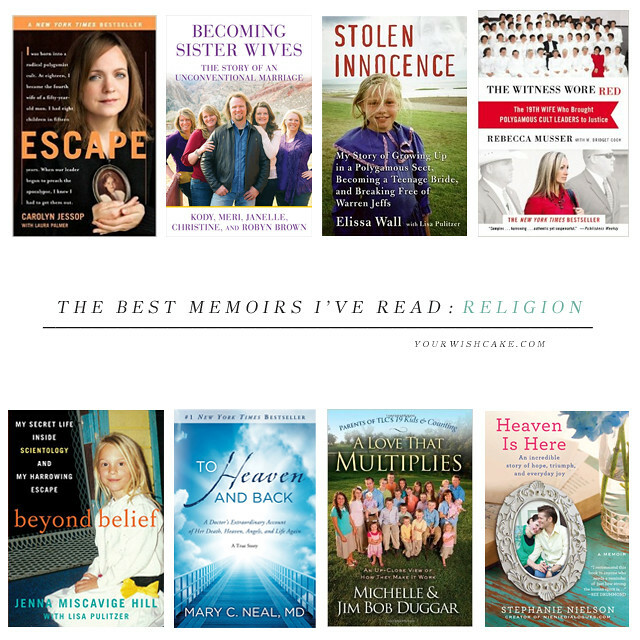 So, without further ado, here are some of the best memoirs on religion I've read! Escape by Carolyn Jessop — If you choose only one book off this list, I hope it's this one! I read this book in just a few sittings and it is definitely one of those that is very (very!) difficult to put down once you start reading it. Her story draws you in from beginning to end, and how she was able to escape such a lifestyle with eight children is nothing short of incredible. I loved her inside look at how life within the FLDS can be (and most likely still is) for many women. Becoming Sister Wives by Kody Brown — There was a time I was legitimately obsessed with the show Sister Wives (which is probably the only show I truly mourned the loss of when we got rid of satellite TV…no shame!). When this book was released, it didn't disappoint! It was actually better than I thought it would be, because it shows just how much you don't get to see on reality TV. You get a much more intimate look at the struggles each of the wives went through (and still experience), with chapters written by each of the women within the family. The book feels like a much more accurate, honest picture of what modern polygamy actually is (from my very limited perspective) and if you have any interest in this family, you won't want to miss this book. Stolen Innocence by Elissa Wall — This author was yet another teenage bride within the FLDS (married off to a cousin, of all people) and her story is definitely heartbreaking. It's one of those stories that make you wonder how a mother, father, sister, or anyone else could stand by and let these things happen to a child (she was only 14 when she was forced to marry), regardless of social norms or "religious" beliefs. It's incredible how far she came from that point, despite everyone around her essentially forcing her to do their will —and after years of struggle, her testimony even helped put Warren Jeffs behind bars. The Witness Wore Red by Rebecca Musser — This is a beautifully written book (by the sister of the author of the above book, actually!) and was an incredibly powerful read. It's a little surprising how many books on this specific subject I can read, yet not lose interest, but I think it's because although there are very similar threads within each memoir, every woman's story is so unique. The author of this particular book was married as a teenager to then-profit Rulon Jeffs, who was 85 years old (and, coincidentally, the father of Warren Jeffs). Her inside look at the leader of the FLDS—and his entire family—makes this book especially captivating. I can't help but admire her bravery despite all she endured, and all she did to bring many of those polygamous leaders to justice. Beyond Belief by Jenna Miscavige Hill — There aren't that many books out there on Scientology (except the ones promoting Scientology) so this one caught my attention immediately. This book tells the story of Jenna, niece of the current leader of the Church of Scientology. Read it. No, really. Her story is so honest, raw, and captivating. It's one of those stories that is so detailed, and sharing it most likely caused her more strife than anything else (especially due to being estranged from most of her family after leaving the church), so I tend to believe what she shared within the pages. So much of it is so bizarre that I was left wondering, Who could even make this stuff up? A Love that Multiplies by Michelle and Jim Bob Duggar — Say what you will about this family, but I love 'em. I actually want to throw this book at people when they are overly critical about the Duggars' lifestyle and end up repeating things they read about them on the internet. If you have a genuine interest about how (and why) they live the way they do, this is a great read and I promise it will soften your opinion of them. They are very open and honest about their beliefs, struggles, and faith—and clear up some of the many misconceptions about their family, like the rumor that they are part of the "Quiverfull" movement (they're not) or that they believe everyone should live the way they do (they don't) or that they force their daughters to wear long skirts and stay in the kitchen and prevent them from doing anything outside of traditional gender roles (they don't). You may even like them a little bit (or a lot, like I do!) after reading this book. If anything, it will at least give you a more accurate view of their beliefs! Heaven is Here by Stephanie Nielson — I remember when I picked up this book at the library, surprised to discover it was written by the woman behind the popular blog NieNie Dialogues. This book tells not only the story of the plane crash that left both her and her husband with an intense, painful recovery (more than 80% of her body was burned), but also the love story between between them and a beautifully honest description of motherhood and family life. I'm putting this one in the religion category because Stephanie talks a lot about her Mormon roots, which ends up as a central theme of her story. I want to read this one again (it's been years since I first picked it up!) because her story of survival is incredible, and she is just a beautiful, beautiful writer. Sounds like we have a lot of the same tastes! I just downloaded "Escape" & have been waiting on "Beyond Belief" to become available at the library. I also love books about the FLDS! I don't know what it is. And I've wanted to get into some of those Scientology books. I've also read Favorite Wife: Escape From Polygamy by Susan Schmidt. Crazy story! Oh, goodness! I'm so glad you mentioned this, because apparently there IS an FLDS memoir out there that I haven't devoured! :) Thanks for the recommendation, I'll have to request that one from the library this week. I haven't read it yet, but my mom's book club did recently, and they all raved about this one ( an older title): Secret Ceremonies: A Mormon Woman's Intimate Diary of Marriage and Beyond by Deborah Laake. Just added it to my list—I hadn't even heard of that one until you mentioned it. Thank you so much for the recommendation! I typed this comment already but I think the internet ate it? I haven't read Beyond Belief but I just finished reading Going Clear. It's not a memoir but it is about the origin of Scientology, L. Ron Hubbard, the inner workings of the organization, and David Miscavige. Like you with Beyond Belief, I couldn't believe half of the things I was reading. I definitely recommend it, especially to find out more about what Jenna was coming from. I would also recommend Banished: Surviving my years in the Westboro Baptist Church by Lauren Drain if you haven't read it. It's a good one.